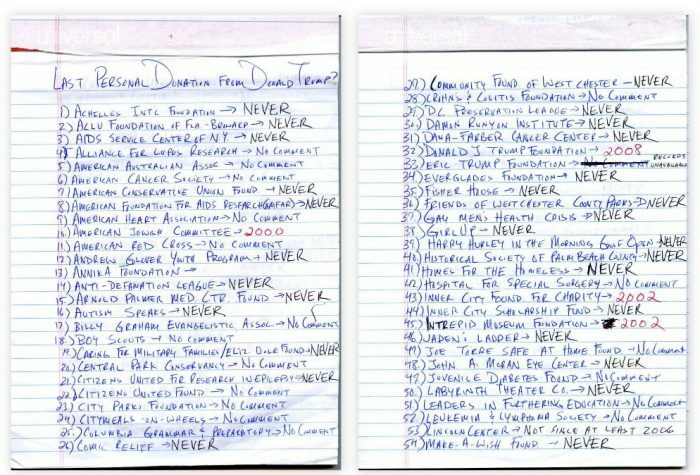 Sept. 9, 2016, 9:30 a.m.
By Ricardo Bilton @rbilton Sept. 9, 2016, 9:30 a.m.
Washington Post politics reporter David Fahrenthold is trying to find evidence of Donald Trump’s charitable donations, but he’s running out of paper. Since early May, Fahrenthold has painstakingly chased Trump’s claims of giving millions of dollars of his own money to charities. So far, the investigation hasn’t turned up much evidence of that. Fahrenthold has contacted over 350 charities over the past few months, a process that he’s methodically tracked on 12 sheets of legal paper using three different colors of pen. He’s periodically posted the list to Twitter in an effort to both crowdsource suggestions on where to search next and to add a layer of transparency to his entire reporting process. I spoke with Fahrenthold about why he believes his approach is more than a gimmick, the importance of transparency in reporting, and why it’s been so difficult to cover Trump. Here’s our conversation, lightly edited. Ricardo Bilton: When you started reporting this story in May, did you think you’d still be working on it now? David Fahrenthold: Not at all. Trump has been saying for years that he gives away millions of dollars. I figured that after a little while, either I’d find some of it or Trump would say, “Here’s a list.” I honestly did not think it would last from June until now. I didn’t think that it would become such a long story because I thought that either he would tell his something or I would find something now and then. Bilton: There have obviously been a lot of stories focused on many parts of Trump and his campaign. Why use pen and paper to present this one? Fahrenthold: I think I knew there was going to be a lot of futility to the process. I knew I was going to call up a lot of people who weren’t going to have gotten money from him. I was looking for a way to make the futility look interesting and give people something to follow. The old school way to do this would have been to every couple of weeks write a story saying “I’ve now called 300 charities and this is what I’ve found.” But this gives people a way to follow it along in realtime. Part of the idea is that I want people to see the list that I have, and if they know something that they think Trump might have given money to, they can suggest it. This reporting has produced a lot of individual stories. Like the time that I found another Donald Trump who actually gives a lot of money to charity or the situation with the Tim Tebow helmet. There are all these sort of spinoff things that gave me some insight into Trump. Using the list has been a good way to remind people that these one-off things are all related to some larger narrative. It helps people remember that its all related to what they’ve read about before. Bilton: What’s been the response internally? Fahrenthold: The day I started doing it, the people here who run social media were a bit skeptical of it, because it felt a bit old school and low tech. But I thought it made it much more visually interesting because you can add color. I used different color pens for the “never” and the “no comments” and the actual donations. It just makes it easier to follow visually. Makes a 300 line list by hand. Bilton: I’ve been surprised at range of responses. On one hand, you have people like Glenn Greenwald praising the transparency, but you also have people who think you’re wasting your time by doing this all by hand. What’s surprised you about how people have reacted? Fahrenthold: I’ve been surprised at how engaged people have gotten, both in terms of asking me questions and offering their own suggestions. One example was the case of the three things that I found that were named after Donald Trump, that had Trump’s name on them as a result of a charitable gift. These were two theater seats and a bench. These were things that readers found. People would go into a theater in New Jersey or Florida and remember me because they read about me or saw me on Twitter. Each of those things is its own funny story because they show you the smallness of Trump’s donations that he gets one theater seat. I’ve been really surprised at how many people I’ve reached and how willing they’ve been to help. Bilton: A lot of reporters have struggled to cover Trump and his campaign, which is so different from anything that’s come before. How does this fit in with that? Fahrenthold: One interesting thing about covering Trump is that because every day there’s a new thing or new topic. Using the list has enabled me to remind people of this thing day after day. Maybe it helps it not get washed away by whatever the current controversy of the day is, because people will remember visually that they saw weeks ago and helps them remember what I’m doing. Bilton: Does this story feel different from all of the other ones? Fahrenthold: The thing that I like about this story is that it’s not about Trump’s words. So much of this campaign has been about “What did Trump say? Is it different than what he said yesterday? Is it different from what he said in the past?” We’re built to cover presidential candidates that are 99 percent the same from day-to-day, and whatever change they make has real meaning. But Trump changes his words from day-to-day on things like the Muslim ban or mass deportation. If you cover Trump’s words, you’re always just chasing your tail and letting him set the narrative. It’s hard to pin him down. With this, you’re judging him by his actions, not his words. Bilton: One thing you hear a lot about this news cycle is that it’s post-truth or post-fact. Trust in the media is also very low, historically. Do you think that this kind of transparency and attention to detail helps in some way with that? Fahrenthold: What I wanted to do with this was give people a way to see what I did. I’m not trying to conceal anything about what I’ve tried and I’m open to people suggestions. If people write to me and say I’m a hack and you missed this thing, I aways say “tell me more” and I’ll put it on my list and I’ll call those people. And I’ve gotten a lot of tips even from people who started out being really hostile. If Trump has a suggestion of where I should look, I’ll look. I just want to be transparent about why I called these groups and who I called and what I learned. I’m hoping that people who come in with that degree of distrust see that and appreciate it. POSTED Sept. 9, 2016, 9:30 a.m.
Bilton, Ricardo. "How one Washington Post reporter uses pen and paper to make his tracking of Trump get noticed." Nieman Journalism Lab. Nieman Foundation for Journalism at Harvard, 9 Sep. 2016. Web. 23 Apr. 2019. Bilton, Ricardo. "How one Washington Post reporter uses pen and paper to make his tracking of Trump get noticed." Nieman Journalism Lab. Last modified September 9, 2016. Accessed April 23, 2019. https://www.niemanlab.org/2016/09/how-one-washington-post-reporter-uses-pen-and-paper-to-make-his-tracking-of-trump-get-noticed/.